ARTISTS IN RESIDENCE: Zionsville resident Kathy Leachman looks at artwork by Boone County residents over 60 at the Lebanon Public Library Friday. Leachman's watercolor, "Summer with Grandchildren" seen at the bottom right, won first place for amateur painting. The thirty photos and paintings will be displayed at the library through May 26 as part of the annual Boone County Senior Services Inc. Art and Photography Contest. Some of the paintings are for sale, and BCSSI will make contact between potential buyers and the artists. Amateur painting: First place: Kathy Leachman, of Zionsville; second place: Delma Mindel, of Zionsville; third place: Paul Orr, of Lebanon. Advanced Painting: First place: Shirley Luttrell, of Zionsville; second place: Char Hulse, of Lebanon; third place: Betty Jane Eads, of Lebanon. Photography: First place: Beverly Hoover, of Jamestown; second place: Rex Bowman, of Lebanon. 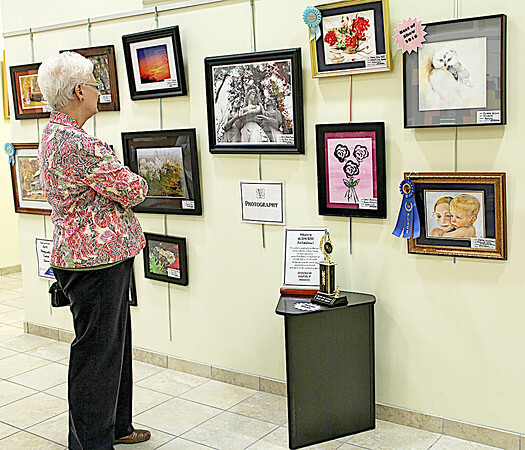 Best of Show: Diane Giles, of Brownsburg, for her amateur painting titled “Wisdom," seen at the top right of the photo. BCSSI offers art classes in Lebanon and Zionsville. For more information, contact Anita Bowen or Judy Brower at (765)482-5220 or (317)873-8939, or by e-mail bcssi@booneseniors.org.